There’s one egg in every few clutches that seems a little eccentric. Maybe it’s got a cracked shell or a few extra speckles. Maybe it has a really fowl odor. Maybe you hear the sound of distant accordions whenever it’s nearby—and in that case, we recommend seeking immediate medical attention. But at no point would we suggest throwing out the oddballs, because we know that the funkiest chickens always come in unusual packages like this one! 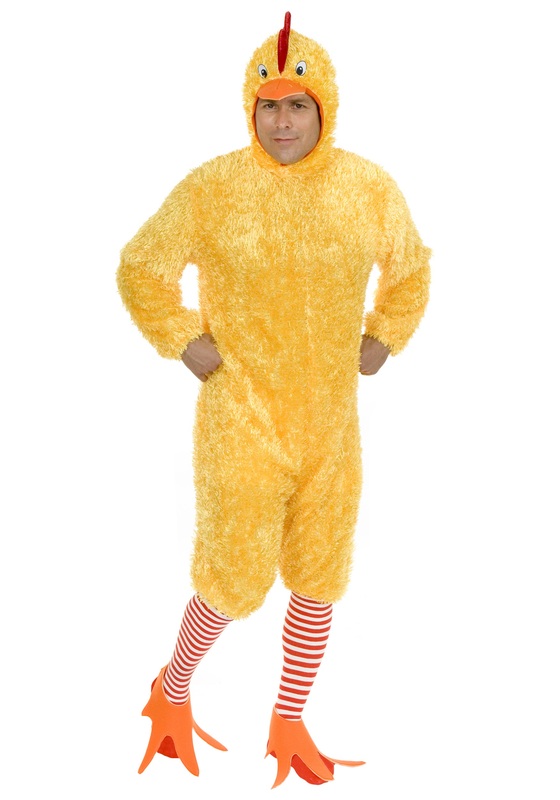 If you’re one of those people who would rather have actual feathers instead of the plush microfiber of this Plus Size Funky Chicken Costume, or a realistic mask instead of the hilarious beaked hood on this quirky outfit, we suggest you look into generic rooster suits. But if you believe in yourself and trust in the ineffable charm of an extra-large, extra-yellow chicken strutting its stuff, you’ll be freeing minds and shaking tailfeathers loose in no time! Because there’s nothing people love more than dance lessons, unless it’s dance lessons from a plucky instructor with tender thighs and crispy wings. And in this costume, that’s not exactly what you’ll be—but it’s probably close enough. Come to think of it, a dancing pile of fried chicken would be downright terrifying. Well, that image should keep our nightmares well-fed for a few days! But don’t let our fast food phobias deter you from trying out this amazing piece of avian attire. It’s a four-piece poultry platter with all the funky fixings. Just add your own special blend of spices! This is adorable and everyone loved it. I wish though it had a snap or a zipper to close it. The Velcro kept sticking to the costume and it was difficult to. Remove it without tearing the costume. I had to have help closing the back. No way could you put this on and unstuck the Velcro. Bad design. I purchased this costume for my daughter. She tried it on and couldn't stop laughing at herself in the mirror!! She loved it!! Definitely the best costume she has ever had!